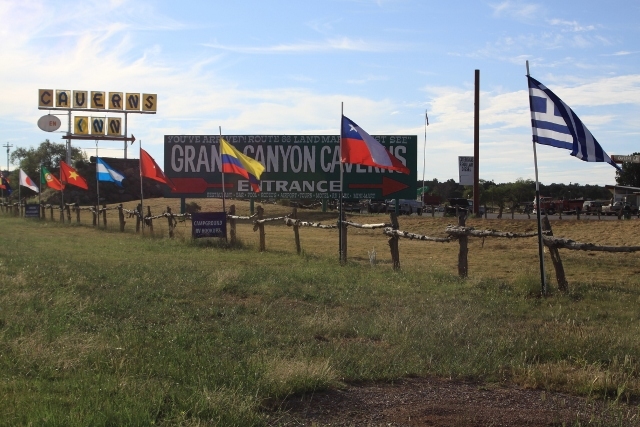 I have been making stops at the Grand Canyon Caverns complex for one reason or another since at least 1966. This weekend, however, is the first time that I included an overnight stay. What a delightful little gem! When my dearest friend and I travel, we strive to see a motel, a restaurant, or an attraction as though it is our first visit. Obviously, that can be a bit difficult, especially if it is a place visited at least one hundred times. 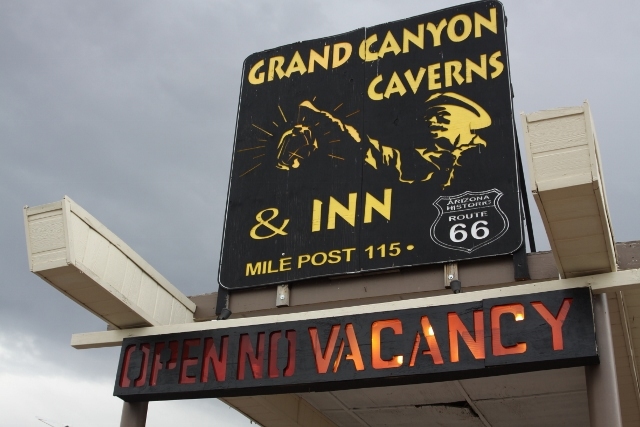 With our stay at the Grand Canyon Caverns Resort this was surprisingly easy as the owners strive daily to breathe new life into the historic roadside attraction while preserving the illusion that time stopped at some point around 1965. As an example, during our visit, new flat screen televisions were being added to several rooms. Even though the restaurant appears unchanged from 1965, or even 1955, it was recently fully renovated. As a bonus the menu is diverse, and the food quite good. Even better, a variety of delicious fresh baked pies are now available. The motel and the restaurant are but two manifestations of the owners passion for preserving this little roadside time capsule while transforming it into a destination for a new generation of Route 66 adventurers. Another would be the fully renovated RV park that recently garnered accolades from Good Sam. As a whole, the complex is a near perfect time capsule of the Route 66 roadside in the years before that highway was eclipsed by the interstate. This too is merely a carefully crafted illusion as the resort mirrors the Route 66 renaissance with all of its vibrancy. By no means is the resort without flaw or blemish. Regardless of an owners zeal, infectious enthusiasm, vision, and tireless ambition decades of neglect and abandonment are not reversed overnight. It takes years to turn back the hands of time. Still, I found the resort to be one part living history museum, and one part portal into the future of Route 66. From the quirky miniature golf course, a recent addition, and metal sculptures intermingled among a variety of dinosaurs to the caverns with its stockpile of Civil Defense supplies and the multifaceted activities that range from trail rides to disk golf and a star gazers observatory Grand Canyon Caverns perfectly captures the essence of the Route 66 experience in one neat little package. For an afternoon, for an evening, or for a weekend, I can honestly suggest that you add Grand Canyon Caverns to your Route 66 travel plans. 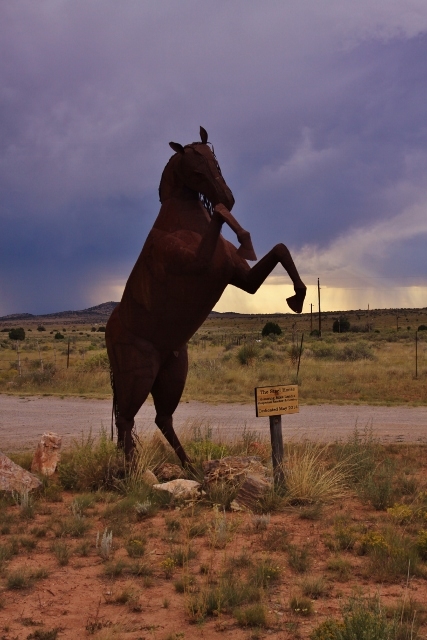 Our weekend vacation commenced with a pleasant drive east along Route 66 as storm clouds filled the sky. After arrival and checking in (room number 37) we eagerly headed for the miniature golf course like a couple of kids on holiday. The nine-hole course is a throwback to an earlier, simpler time, the sort of thing that used to be found all along Route 66. The home made course was laid out around a golf cart grave yard, and a variety of dinosaurs that hinted of the property’s earlier life when it was promoted as Dinosaur Caverns. A cool rain scented breeze enhanced our laughter filled visitation with youth as we endeavored to negotiate the deceptively challenging course. We will not discuss scores but suffice to say, professionals we are not. Our golf adventure was followed with a most delightful dinner shared with John McEnulty, the passionate owner of the property who wears a permanent smile, his son Sean, and their family friends, Jim and Kathy. Lively conversation, lots of laughter, a couple of glasses of wine (beer for me), and some very delicious chocolate cream pie rounded out the evening. As with many vintage motels on Route 66, this one is not for those in search of the Marriott or Hilton. 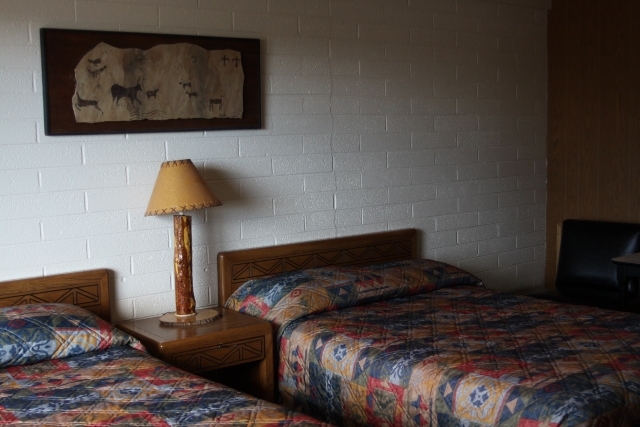 Our room was a true time capsule; simple, clean, and quiet with authentic or period mimicking furnishings. It was exactly what the Route 66 enthusiast searches for, a pleasant and restful time capsule. The free breakfast that is a part of the room package was simple, basic fare. However, it was quite adequate. As enjoyable and restful as our little vacation getaway was, the highlight was in the opportunity to watch and interact with visitors. Children bubbling with excitement, teenagers having fun with their families, the sound of laughter, and the smiling faces left me feeling quite confident that in resorts such as Grand Canyon Caverns are the seeds for ensuring that Route 66 remains a destination for a new generation, and for generations to come.